Just as the drinks menu nears completion for our Big Day Out at the Brewery next Saturday, the musical menu has now taken proper shape. Turn It On play music everywhere it’s needed — including K2! They’ll entertain us from around 3–5pm. A community of music lovers, Turn It On run vinyl nights and DJ events, festivals and parties. Shortly after 6pm we’ll be treated to a special preview performance from one of the artists performing at this year’s Earagail Arts Festival. The 10-piece Basork fusion group will fill K2 with Balkan-Irish sounds in what promises to be a lively curtain-closer to the big day. Indie Beer Week Ireland kicks off on Friday next, 23 June and runs until Sunday 2 July. Throughout the country, 27 independent Irish breweries will invite their local communities to visit them for special events to discover where and how real beer is made. Brewers talk of “brew length” and the most frequently named unit of measurement is a hectolitre (that’s 100L, for those of us who don’t hail from continental Europe). So in technical lingo, Minniegar was a 0.5HL brewery, our current set-up is 10HL and K2 will be 35HL. But we prefer to use a more familiar unit of measurement to give a layman’s impression of the scale. Here’s Zack on the current site in early April 2013 when the walls had just gone up. Missing Your Favourite Kinnegar in the West of Ireland? We recently changed our distribution partner for the west of Ireland. And while we hope the transition will go as smoothly as possible, we can’t rule out the odd bump or two in the supply chain. But don’t despair! Should you find yourself unable to get your favourite Kinnegar in your favourite pub, restaurant or off-license, be sure to let the staff know that they can either contact us here at the brewery or else call Paul Russell of Grand Cru Beers on 086 185 2944. Between us, we’ll get the beer flowing to them again. And a big thanks, as ever, for your continued support. Where was Kinnegar four years ago? As the clock ticks rapidly in the direction of K2, it’s hard not to think back to what was going on when K1 was coming to life. We’re going to root out some photos of the development phase over the next few days but this photo provides the answer to the first question. Four years ago, in January 2013, we were still working in the pilot brewery. Rick brewed. Libby packaged. Very straightforward. Here’s a rare photo of Rick at work in what our future American intern, Maxmarie, would immortally dub “Minniegar”. Photography in the steam-filled room was always a bit of a challenge. We brewed 50L batches and production, by the time we moved out of Minniegar, was 150L per week. 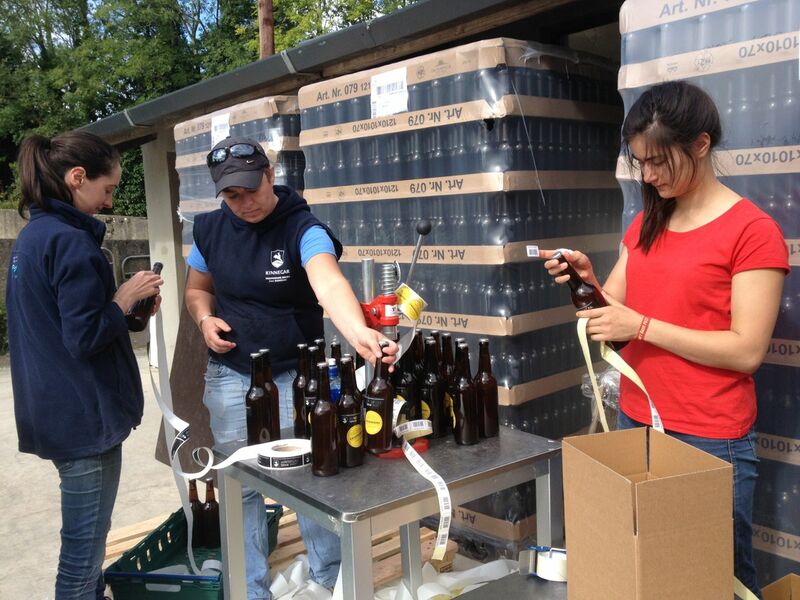 That translated into an average of 120L of packaged product, or 240 bottles of beer a week. Limeburner, Devil’s Backbone, Scraggy Bay and Rustbucket were all born in Minniegar. We’ll add additional tour times on these days, if needed. Remember that you must book in advance on 086 830 1392. Tours cost €10 and last approximately one and a quarter hours. Ever wondered what kind of a machine we have for labelling our specials? It’s a very unusual custom-made model called a Louandron and is absolutely unique to Kinnegar Brewing. Here it is concluding the labelling of Geuzberry yesterday in record time. 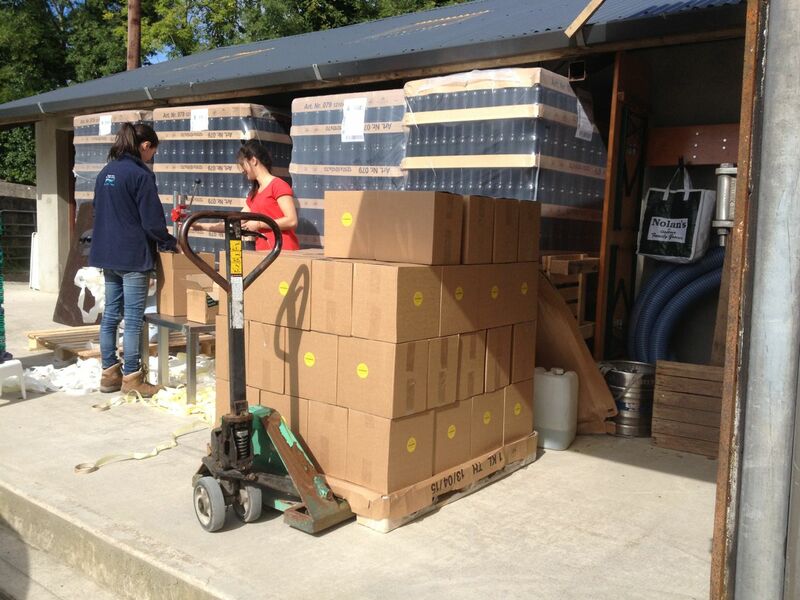 Note that the pallet of cases in the photo below is the sum total of the 384L of bottled Geuzberry stock. Please don’t give your local outlet grief if they don’t have any — there’s just not enough to go round!